There have been promotions, there have been relegations and there have been tense last day matches. Only recently chairman Barry Kilby spoke about the days just before and after he joined the board when we looked doomed to drop back down with only a last day reprieve in 1998 preventing us from returning to the basement division just months before his arrival on the board. Two years on and there was that wonderful day at Scunthorpe that saw the Clarets back into the top two divisions of English football, a position we've hardly looked like relinquishing since, and there has even been a season in the Premier League to enjoy. There have been others too, and one fifty two years ago will never be forgotten as we won a last match 2-1 at Manchester City to be crowned Champions of England. Somehow though there will never be anything like that day 25 years ago. This wasn't about promotion or relegation, this was about the future existence of our club. Just twelve years earlier we had led the First Division table and quite how we fell from this to ninety minutes from extinction is difficult to believe. Yes we can blame John Bond for all we like but it would be a serious mistake to do so, as bad as he was for Burnley Football Club it is at times amusing to see him blamed even for things that happened before he arrived at Burnley. With the Clarets in the basement division for the second season a new rule was introduced that would see the bottom club automatically replaced by the Conference Champions. So what, even in a poor first season we had finished in fourteenth place. Sometimes the big clubs (or those that perceive themselves to be big clubs) can be so complacent. We started well and after seven games we were fifth but a decline was to set in and when Cardiff came to the Turf and won in December we had slipped to nineteenth place. There was no need to worry though, we had a lead on some Unprofessional outfit from Stockport of nine points and after picking up four points over the Christmas period we climbed three places and increased the lead over the bottom club to eleven points. The possibility of being the first club to suffer automatic relegation had never been discussed, never thought of as a possibility. That was until we then went on a run of ten games without a solitary win. There was even the major embarrassment of a 6-0 home defeat against Hereford United. Suddenly working in Preston I was being told by the North End fans that we could be the ones to go. Stockport had got themselves within two points and with two games in hand but nine points behind us were Rochdale although they did have five games more to play. Then our prayers were answered with two wins. Firstly a 1-0 win at Stockport with an Ashley Hoskin goal and then the following Tuesday we beat league leaders Northampton 2-1. Hoskin scored again with Joe Gallagher having got the first. Now we were pulling away from danger and were even eight points clear of third from bottom but not for long. Not a single point was picked up from the next four games and we were suddenly in our worst position yet, third from bottom and only four points clear. Then suddenly three games without defeat but it made little difference, all the teams at the bottom were picking up points. The win at Rochdale saw complacency creep in on the terraces but three of the last five games were away and all three were lost. There was a home win in between but incredibly with one game to go, after a disastrous 1-0 defeat at Crewe we were bottom with 46 points and things were looking bleak. We needed to win our last game and hope that one of Lincoln, Torquay, Rochdale or Tranmere slipped up and Rochdale had a game in hand. Where were Stockport? They had pulled themselves safe and had 51 points. Rochdale won their game in hand during the week and they were safe. Tranmere were allowed to play their game on the Friday night and they were safe. It was between the three of us. We all know the result, that's why we are here today looking back. I'm sure we are looking back with nothing but relief. In the end both Lincoln and Torquay fell below the Clarets and it was Lincoln who went down. When Lincoln beat the Clarets on 3rd January they went seventh in the league with 34 points from 23 games. The second 23 game brought them just 13 points. At the time everyone said it can't happen again. It should never have happened in the first place but what can happen once can happen twice. What we must do now is make damn sure it doesn't. 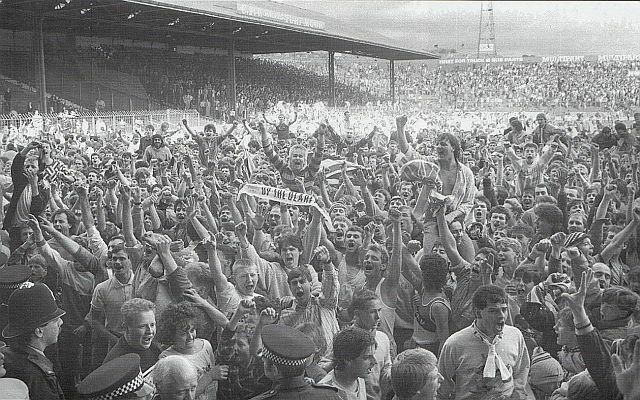 Whatever the future holds for this great club of ours I never want our supporters of the future to have to go through the day we went through on 9th May 1987. The players that day were the ones who had got us there in the first place but for their efforts that day they will always be thought of as heroes. For certain they will always have my thanks. The team was: Joe Neenan, Peter Leebrook, Peter Hampton, Billy Rodaway, Joe Gallagher, Ray Deakin, Neil Grewcock, Phil Malley, Leighton James, Phil Devaney, Ian Britton. Sub: Ashley Hoskin. And then of course there was manager Brian Miller and his assistant Arthur Bellamy. They took on the mess a year earlier and steered us through, just about, and to this day I will never know how they, and Brian in particular, coped with the pressures that day. Remember the date, 9th May 1987, we must never forget it.